Over the upcoming winter break, the Libraries will be closed on all Institute holidays (December 22-25 and December 29-January 1) and will provide service at two locations on campus December 26-28. 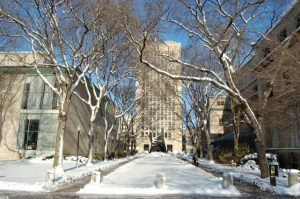 Access to electronic resources, such as journals and databases, and secure 24/7 study spaces with an MIT ID will remain available for the entire winter break. In addition, self-service access to circulating collections in Dewey and Hayden, online requesting via Your Account for collections in Barker, Lewis, and Rotch, and virtual research support will be available December 26-28. By providing staffing at Hayden and Dewey libraries December 26-28, we are able to provide services for those community members who require library resources and spaces during that time, while also giving library staff members the opportunity to use vacation and enjoy some time off during the holidays. If you have any questions, comments, or concerns about the Libraries’ holiday schedule and service, please contact yashu@mit.edu.